EL PASO, Texas (CNS) — In Segundo Barrio, people having been praying day and night for Pope Francis since he set foot in Mexico. Kneelers were set in front of a figure of the pope in the courtyard of the barrio’s Sacred Heart Church. An image of Our Lady of Guadalupe in tile on a red brick wall peered over the shoulder of his cardboard likeness. 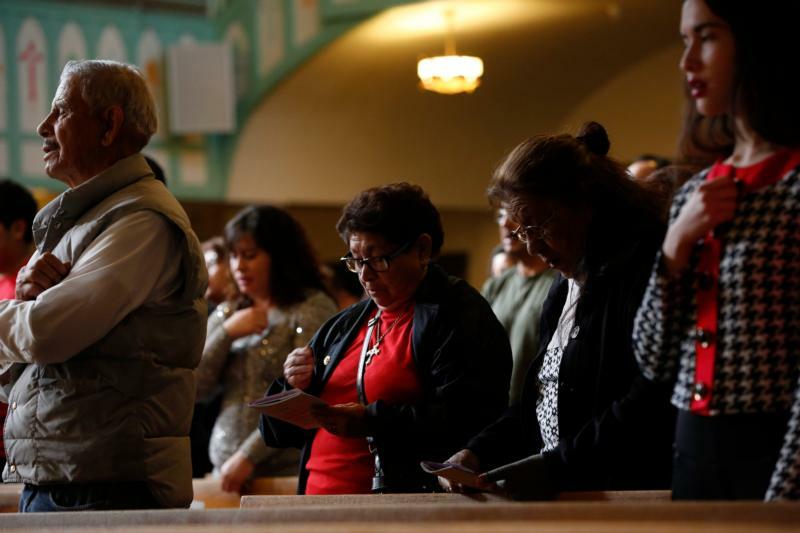 Williams was among dozens of parishioners stopping to pray at the temporary shrine Feb. 14, three days before the pope was to end his six-day Mexican visit in Ciudad Juarez, the Mexican community on the border and El Paso’s sister city. Images of the pope with words of welcome appeared on walls in and around Sacred Heart Church and the Segundo neighborhood. A culturally vibrant parish, Sacred Heart’s roots stretch back nearly 125 years. It is located blocks from one of El Paso’s busy border crossings. Jesuit-founded and run, the parish serves people in the barrio as well as immigrants and people passing through. Masses are held in Spanish or in English and Spanish. With its sacramental and catechetical ministries, the parish offers English classes and courses in computer literacy and citizenship. From its parish hall, it runs a restaurant and catering business that employs people and offers low-cost meals. Florencio Flores, who was born in Mexico but was brought to the U.S. as an infant, has called Segundo Barrio home for quite some time. He stopped in Sacred Heart’s courtyard to kneel and offer a short prayer. He carried the parish bulletin featuring Pope Francis on the front. Also visiting the makeshift shrine was the Macias family. Flor, Olivia and Rose Macias stood in front of the cardboard pope and smiled brightly as their dad clicked a cellphone photo. It is as close as most will get to the pope himself, but that had not dampened their excitement for his visit to the border area. The archbishop will be with other Americans on the levee in El Paso when Pope Francis celebrates Mass in Ciudad Juarez.